Dream Guitar album on Strat-talk.com – real or fake? Today I surfed into the Strat-Talk.com forum where I found a photo album with 12 famous dream guitars. Among these were some Strats and Teles of David Gilmour, George Harrison, Jimi Hendrix, and three guitars of Mark Knopfler (the red Schecter Strat and Tele, and the red Fender), all in the same high resolution. The question: Are these real or are they fakes? You can use the comment function to express your opinion. 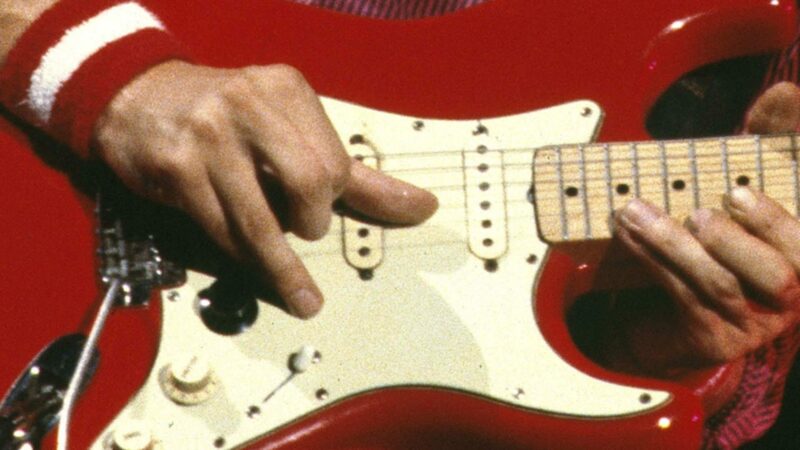 Early Dire Straits: Which of the two red Fenders was used in which concert? Fakes I think, the decal on the schecters is misalligned and the red tele is not marked at all certainly not like that. The schecter strat has blemishes on the fret board, but the 61 looks near enough. ah the bridge on the red schecter strat is a vintage strat not a schecter – got you! Have a close look, there are more details that are not right. Actually, I posted those, they’re just mock-ups based on images I’ve seen around on the net (and not least from this page), and made by editing the pictures on the fender website. I’m constantly upgrading them, so any suggestions of changes, or things I’ve missed would be great. You flatter me with your attention! Probably should have mentioned this in the last post, but the pictures are usually, 409 x 1250, and full length, I just edited the size to fit the upload allowance on strat-talk. With this in mind, if anyone here wants copies of the ones on strat-talk or requests for any others, feel free to ask. Thanks, I’ve made most of the changes you suggested, but I can’t find an image of the Schecter headstock decal detailed enough to see the font, and wasn’t sure exactly the problem with the colour of the Fender, so I’ve not changed that yet. I can’t believe I forgot the whole neck on the Schecter strat! Sorry to double post again, but I thought I should mention that having looked at them again, I realise that not all the images are edited ones from the Fender site (although all the Knopflers are). David Gilmour’s black strat is an unedited scan, the body of his esquire is a photo with an edited neck, the Jaguar strat is a scan, and the pickguard and headstock of George’s ‘Rocky’ were photos, though when updating the knopfler ones today, I replaced this image with a scan.